The Song Dynasty ( ; Wade-Giles: Sung Ch'ao) was a ruling dynasty in China between 960 and 1279; it succeeded the Five Dynasties and Ten Kingdoms Period, and was followed by the Yuan Dynasty . It was the first government in world history to issue banknotes or paper money, and the first Chinese government to establish a permanent standing navy. This dynasty also saw the first known use of gunpowder, as well as first discernment of true north using a compass. The Song Dynasty is divided into two distinct periods: the Northern Song and Southern Song. During the Northern Song ( , 960–1127), the Song capital was in the northern city of Bianjing (now Kaifeng ) and the dynasty controlled most of inner China. The Southern Song ( , 1127–1279) refers to the period after the Song lost control of northern China to the Jin Dynasty. 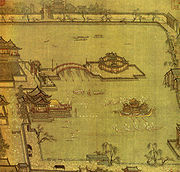 During this time, the Song court retreated south of the Yangtze River and established their capital at Lin'an (now Hangzhou ). Although the Song Dynasty had lost control of the traditional birthplace of Chinese civilization along the Yellow River , the Song economy was not in ruins, as the Southern Song Empire contained 60 percent of China's population and a majority of the most productive agricultural land. The Southern Song Dynasty considerably bolstered its naval strength to defend its waters and land borders and to conduct maritime missions abroad. To repel the Jin, and later the Mongols, the Song developed revolutionary new military technology augmented by the use of gunpowder. In 1234, the Jin Dynasty was conquered by the Mongols, who took control of northern China, maintaining uneasy relations with the Southern Song. Möngke Khan, the fourth Great Khan of the Mongol Empire, died in 1259 while besieging a city in Chongqing . His younger brother Kublai Khan was proclaimed the new Great Khan, though his claim was only partially recognized by the Mongols in the west. In 1271, Kublai Khan was proclaimed the Emperor of China. After two decades of sporadic warfare, Kublai Khan's armies conquered the Song Dynasty in 1279. China was once again unified, under the Yuan Dynasty (1271–1368). The population of China doubled in size during the 10th and 11th centuries. This growth came through expanded rice cultivation in central and southern China, the use of early-ripening rice from southeast and southern Asia, and the production of abundant food surpluses. The Northern Song census recorded a population of roughly 50 million, much like the Han and Tang dynasties. This data is found in the Standard Histories. However, it is estimated that the Northern Song had a population of some 100 million people, and 200 million by the time of the Ming Dynasty . This dramatic increase of population fomented an economic revolution in premodern China. The expansion of the population was partially the cause for the gradual withdrawal of the central government from heavily regulating the market economy. A much larger populace also increased the importance of the lower gentry's role in grassroots administration and local affairs. Appointed officials in county and provincial centers relied upon the scholarly gentry for their services, sponsorship, and local supervision. Social life during the Song was vibrant; social elites gathered to view and trade precious artworks, the populace intermingled at public festivals and private clubs, and cities had lively entertainment quarters. The spread of literature and knowledge was enhanced by the earlier invention of woodblock printing and the 11th-century invention of movable type printing. Pre-modern technology, science, philosophy, mathematics, engineering, and other intellectual pursuits flourished over the course of the Song. Philosophers such as Cheng Yi and Zhu Xi reinvigorated Confucianism with new commentary, infused with Buddhist ideals, and emphasized a new organization of classic texts that brought out the core doctrine of Neo-Confucianism. Although the institution of the civil service examinations had existed since the Sui Dynasty, it became much more prominent in the Song period. This became a leading factor in the shift of an aristocratic elite to a bureaucratic elite. Emperor Taizu of Song (r. 960–976) unified China through conquering other lands during his reign, ending the upheaval of the Five Dynasties and Ten Kingdoms Period. In Kaifeng , he established a strong central government over the empire. He ensured administrative stability by promoting the civil service examination system of drafting state bureaucrats by skill and merit (instead of aristocrat or military position) and promoted projects that ensured efficiency in communication throughout the empire. One such project was the creation by cartographers of detailed maps of each province and city which were then collected in a large atlas. He also promoted groundbreaking science and technological innovations by supporting such works as the astronomical clock tower designed and built by the engineer Zhang Sixun. The Song court maintained diplomatic relations with Chola India, Fatimid Egypt, Srivijayan Indonesia, the Kara-Khanid Khanate of Central Asia, and other countries that were also trade partners. However, it was China's closest neighboring states which would have the greatest impact on its domestic and foreign policy. From its inception under Taizu, the Song Dynasty alternated between warfare and diplomacy with the ethnic Khitans of the Liao Dynasty in the northeast and with the Tanguts of the Western Xia Dynasty in the northwest. The Song Dynasty used military force in an attempt to quell the Liao Dynasty and recapture the Sixteen Prefectures, a territory under Khitan control that was traditionally considered to be part of the Chinese domain. However, Song forces were repulsed by the Liao forces who engaged in aggressive yearly campaigns into northern Song territory until 1005 when the signing of the Shanyuan Treaty ended these northern border clashes. The Chinese were forced to provide tribute to the Khitans, although paying this tribute did little damage to the overall Song economy since the Khitans were heavily dependent upon importing massive amounts of goods from the Song Dynasty. More significantly, the Song state recognized the Liao state as its diplomatic equal. The Song Dynasty managed to win several military victories over the Tanguts in the early 11th century, culminating in a campaign led by the polymath scientist, general, and statesman Shen Kuo (1031–1095). However, this campaign was ultimately a failure due to a rival military officer of Shen disobeying direct orders, and the territory gained from the Western Xia was eventually lost. There was also a significant war fought against the Lý Dynasty of Vietnam from 1075 to 1077 over a border dispute and the Song's severing of commercial relations with the Đại Việt kingdom. After Lý forces inflicted heavy damages in a raid on Guangxi, the Song commander Guo Kui (1022–1088) penetrated as far as Thăng Long (modern Hanoi ). However, heavy losses on both sides prompted the Lý commander Thường Kiệt (1019–1105) to make peace overtures, allowing both sides to withdraw from the war effort; captured territories held by both Song and Lý were mutually exchanged in 1082, along with prisoners of war. During the 11th century, political rivalries thoroughly divided members of the court due to the ministers' differing approaches, opinions, and policies regarding the handling of the Song's complex society and thriving economy. The idealist Chancellor, Fan Zhongyan (989–1052), was the first to receive a heated political backlash when he attempted to make such reforms as improving the recruitment system of officials, increasing the salaries for minor officials, and establishing sponsorship programs to allow a wider range of people to be well educated and eligible for state service. After Fan was forced to step down from his office, Wang Anshi (1021–1086) became Chancellor of the imperial court. With the backing of Emperor Shenzong (1067–1085), Wang Anshi severely criticized the educational system and state bureaucracy. Seeking to resolve what he saw as state corruption and negligence, Wang implemented a series of reforms called the New Policies. These involved land tax reform, the establishment of several government monopolies, the support of local militias, and the creation of higher standards for the Imperial examination to make it more practical for men skilled in statecraft to pass. The reforms created political factions in the court. Wang Anshi's New Policies Group (Xin Fa), also known as the 'Reformers', were opposed by the ministers in the 'Conservative' faction led by the historian and Chancellor Sima Guang (1019–1086). As one faction supplanted another in the majority position of the court ministers, it would demote rival officials and exile them to govern remote frontier regions of the empire. One of the prominent victims of the political rivalry, the famous poet and statesman Su Shi (1037–1101), was jailed and eventually exiled for criticizing Wang's reforms. While the central Song court remained politically divided and focused upon its internal affairs, alarming new events to the north in the Liao state finally came to its attention. The Jurchen, a subject tribe within the Liao empire, rebelled against the Liao and formed their own state, the Jin Dynasty (1115–1234). The Song official Tong Guan (1054–1126) advised Emperor Huizong (1100–1125) to form an alliance with the Jurchens, and their joint military campaign toppled and completely conquered the Liao Dynasty by 1125. However, the poor performance and military weakness of the Song army was observed by the Jurchens who immediately broke the alliance with the Song, launching an invasion into Song territory in 1125 and another in 1127; in this latter invasion, the Jurchens captured not only the Song capital at Kaifeng, but the retired emperor Huizong, his successor Qinzong, and most of the Imperial court. This took place in the year of Jingkang (Chinese 靖康) and it is known as the Humiliation of Jingkang (Chinese 靖康之恥). The remaining Song forces regrouped under the self-proclaimed. Emperor Gaozong (1127–1162), and withdrew south of the Yangtze River to establish the Song Dynasty's new capital at Lin'an (in modern Hangzhou ). The Jurchen conquest of northern China and shift of capitals from Kaifeng to Lin'an was the dividing line between the Northern Song Dynasty and Southern Song Dynasty. Although weakened and pushed south along the Huai River, the Southern Song found new ways to bolster its strong economy and defend its own state against the Jin Dynasty. They had able military officers such as Yue Fei and Han Shizhong. The government sponsored massive shipbuilding and harbor improvement projects, and the construction of beacons and seaport warehouses in order to support maritime trade abroad and the major international seaports, such as Quanzhou , Guangzhou , and Xiamen , that were sustaining China's commerce. To protect and support the multitudes of ships sailing for maritime interests into the waters of the East China Sea and Yellow Sea (to Korea and Japan ), Southeast Asia, the Indian Ocean , and the Red Sea , it was a necessity to establish an official standing navy. The Song Dynasty therefore established China's first permanent navy in 1132, with a headquarters at Dinghai. With a permanent navy, the Song were prepared to face the naval forces of the Jin on the Yangtze River in 1161, in the Battle of Tangdao and the Battle of Caishi. During these battles the Song navy employed swift paddle wheel driven naval vessels armed with trebuchet catapults aboard the decks that launched gunpowder bombs. Although the Jin forces boasted 70,000 men on 600 warships, and the Song forces only 3,000 men on 120 warships, the Song Dynasty forces were victorious in both battles due to the destructive power of the bombs and the rapid assaults by paddle wheel ships. The strength of the navy was heavily emphasized after that. A century after the navy was founded it had grown in size to 52,000 fighting marines. The Song government confiscated portions of land owned by the landed gentry in order to raise revenue for these projects, an act which caused dissension and loss of loyalty amongst leading members of Song society but did not stop the Song's defensive preparations. Financial matters were made worse by the fact that many wealthy, land-owning families—some which had officials working for the government—used their social connections with those in office in order to obtain tax-exempt status. Although the Song Dynasty was able to hold back the Jin, a new considerable foe came to power over the steppe, deserts, and plains north of the Jin Dynasty. The Mongols, led by Genghis Khan (r. 1206–1227), initially invaded the Jin Dynasty in 1205 and 1209, engaging in large raids across its borders, and in 1211 an enormous Mongol army was assembled to invade the Jin. The Jin Dynasty was forced to submit and pay tribute to the Mongols as vassals; when the Jin suddenly moved their capital city from Beijing to Kaifeng, the Mongols saw this as a revolt. Under the leadership of Ögedei Khan (r.1229–1241), both the Jin Dynasty and Western Xia Dynasty were conquered by Mongol forces. The Mongols also invaded Korea, the Abbasid Caliphate of the Middle East, and Kievan Rus' of Russia . The Mongols were at one time allied with the Song, but this alliance was broken when the Song recaptured the former imperial capitals of Kaifeng, Luoyang and Chang'an at the collapse of the Jin Dynasty. The Mongol leader Möngke Khan led a campaign against the Song in 1259, but died on August 11 during the Battle of Fishing Town in Chongqing . Möngke's death and the ensuing succession crisis prompted Hulagu Khan to pull the bulk of the Mongol forces out of the Middle East where they were poised to fight the Egyptian Mamluks (who defeated the Mongols at Ain Jalut). Although Hulagu was allied with Kublai Khan, his forces were unable to help in the assault against the Song, due to Hulagu's war with the Golden Horde. Kublai continued the assault against the Song, gaining a temporary foothold on the southern banks of the Yangtze. Kublai made preparations to take Ezhou , but a pending civil war with his brother Ariq Böke—a rival claimant to the Mongol Khaganate—forced Kublai to move with the bulk of his forces back north. In Kublai's absence, the Song forces were ordered by Chancellor Jia Sidao to make an opportune assault, and succeeded in pushing the Mongol forces back to the northern banks of the Yangzi. There were minor border skirmishes until 1265, when Kublai won a significant battle in Sichuan. From 1268 to 1273, Kublai blockaded the Yangzi River with his navy and besieged Xiangyang, the last obstacle in his way to invading the rich Yangzi River basin. Kublai officially declared the creation of the Yuan Dynasty in 1271. In 1275, a Song force of 130,000 troops under Chancellor Jia Sidao was defeated by Kublai's newly appointed commander-in-chief, general Bayan. By 1276, most of the Song territory had been captured by Yuan forces. In the Battle of Yamen on the Pearl River Delta in 1279, the Yuan army, led by the general Zhang Hongfan, finally crushed the Song resistance. The last remaining ruler, the 11-year-old emperor Bing committed suicide, along with the official Lu Xiufu 陆秀夫 and 800 members of the royal clan. On Kublai's orders, carried out by his commander Bayan, the rest of the former imperial family of Song were unharmed; the deposed Emperor Gong was demoted, being given the title 'Duke of Ying', but was eventually exiled to Tibet where he took up a monastic life. The White Jasmine Branch, early 12th century painting; small paintings in the style of round-albums that captured realistic scenes of nature were widely popular in the Southern Song period. The Song Dynasty was an era of administrative sophistication and complex social organization. Some of the largest cities in the world were found in China during this period (Kaifeng and Hangzhou had populations of over a million). People enjoyed various social clubs and entertainment in the cities, and there were many schools and temples to provide the people with education and religious services. The Song government supported multiple forms of social welfare programs, including the establishment of retirement homes, public clinics, and pauper's graveyards. The Song Dynasty supported a widespread postal service that was modeled on the earlier Han Dynasty (202 BC – AD 220) postal system to provide swift communication throughout the empire. The central government employed thousands of postal workers of various ranks and responsibilities to provide service for post offices and larger postal stations. In rural areas, farming peasants either owned their own plots of land, paid rents as tenant farmers, or were serfs on large estates. Although women were on a lower social tier than men (according to Confucian ethics), they enjoyed many social and legal privileges and wielded considerable power at home and in their own small businesses. As Song society became more and more prosperous and parents on the bride's side of the family provided larger dowries for her marriage, women naturally gained many new legal rights in ownership of property. They were also equal in status to men in inheriting family property. There were many notable and well-educated women and it was a common practice for women to educate their sons during their earliest youth. The mother of the scientist, general, diplomat, and statesman Shen Kuo taught him essentials of military strategy. There were also exceptional women writers and poets such as Li Qingzhao (1084–1151), who became famous even in her lifetime. Religion in China during this period had a great effect on people's lives, beliefs and daily activities, and Chinese literature on spirituality was popular. The major deities of Daoism and Buddhism, ancestral spirits and the many deities of Chinese folk religion were worshiped with sacrificial offerings. Tansen Sen asserts that more Buddhist monks from India traveled to China during the Song than in the previous Tang Dynasty (618–907). With many ethnic foreigners traveling to China to conduct trade or live permanently, there came many foreign religions; religious minorities in China included Middle Eastern Muslims, the Kaifeng Jews, and Persian Manichaeans. The populace engaged in a vibrant social and domestic life, enjoying such public festivals as the Lantern Festival or the Qingming Festival. There were entertainment quarters in the cities provided a constant array of amusements. There were puppeteers, acrobats, theater actors, sword swallowers, snake charmers, storytellers, singers and musicians, prostitutes, and places to relax including tea houses, restaurants, and organized banquets. People attended social clubs in large numbers; there were tea clubs, exotic food clubs, antiquarian and art collectors' clubs, horse-loving clubs, poetry clubs and music clubs. Like regional cooking and cuisines in the Song, the era was known for its regional varieties of performing arts styles as well. Theatrical drama was very popular amongst the elite and general populace, although Classical Chinese—not the vernacular language—was spoken by actors on stage. The four largest drama theatres in Kaifeng could hold audiences of several thousand each. There were also notable domestic pastimes, as people at home enjoyed activities such as the go and xiangqi board games. During this period greater emphasis was laid upon the civil service system of recruiting officials; this was based upon degrees acquired through competitive examinations, in an effort to select the most capable individuals for governance. Selecting men for office through proven merit was an ancient idea in China. The civil service system became institutionalized on a small scale during the Sui and Tang dynasties, but by the Song period it became virtually the only means for drafting officials into the government. The advent of widespread printing helped to widely circulate Confucian teachings and to educate more and more eligible candidates for the exams. This can be seen in the number of exam takers for the low-level prefectural exams rising from 30,000 annual candidates in the early 11th century to 400,000 candidates by the late 13th century. The civil service and examination system allowed for greater meritocracy, social mobility, and equality in competition for those wishing to attain an official seat in government. By using Song state-gathered statistics, Edward A. Kracke, Sudō Yoshiyuki, and Ho Ping-ti supported the hypothesis that simply because one had a father, grandfather, or great-grandfather who had served as an official of state, it did not guarantee that one would obtain the same level of authority. Robert Hartwell and Robert P. Hymes criticized this model, stating that it places too much emphasis on the role of the nuclear family and demonstrates only three paternal ascendants of exam candidates while ignoring the demographic reality of Song China, the significant proportion of males in each generation that had no surviving sons, and the role of the extended family. Many felt disenfranchised by what they saw as a bureaucratic system that favored the land-holding class able to afford the best education. One of the greatest literary critics of this was the official and famous poet Su Shi. Yet Su was a product of his times, as the identity, habits, and attitudes of the scholar-official had become less aristocrat and more bureaucratic with the transition of the periods from Tang to Song. At the beginning of the dynasty, government posts were disproportionately held by two elite social groups: a founding elite who had ties with the founding emperor and a semi-hereditary professional elite who used long-held clan status, family connections and marriage alliances to secure appointments. By the late 11th century, the founding elite became obsolete while political partisanship and factionalism at court undermined the marriage strategies of the professional elite, which dissolved as a distinguishable social group and was replaced by a multitude of gentry families. Due to China's enormous population growth and the body of its appointed scholar-officials being accepted in limited size (about 20,000 active officials during the Song period), the larger scholarly gentry class would now take over grassroots affairs on the vast local level. Excluding the scholar-officials in office, this elite social class consisted of exam candidates, examination degree-holders not yet assigned to an official post, local tutors, and retired officials. These learned men, degree-holders, and local elites supervised local affairs and sponsored necessary facilities of local communities; any local magistrate appointed to his office by the government relied upon the cooperation of the few or many local gentry elites in the area. For example, the Song government—excluding the educational-reformist government under Emperor Huizong—spared little amount of state revenue to maintain prefectural and county schools; instead, the bulk of the funds for schools was drawn from private financing. This limited role of government officials was a departure from the earlier Tang Dynasty (618–907), when the government strictly regulated commercial markets and local affairs; now the government withdrew heavily from regulating commerce and relied upon a mass of local gentry to perform necessary duties in local communities. The gentry distinguished themselves in society through their intellectual and antiquarian pursuits, while the homes of prominent landholders attracted a variety of courtiers including artisans, artists, educational tutors, and entertainers. Despite the disdain for trade, commerce, and the merchant class exhibited by the highly cultured and elite exam-drafted scholar-officials, commercialism played a prominent role in Song culture and society. A scholar-official would be frowned upon by his peers if he pursued means of profiteering outside of his official salary; however, this did not stop many scholar-officials from managing business relations through the use of intermediary agents. The Song judicial system retained most of the legal code of the earlier Tang Dynasty, the basis of traditional Chinese law up until the modern era. Roving sheriffs maintained law and order in the municipal jurisdictions and occasionally ventured into the countryside. Official magistrates overseeing court cases were not only expected to be well-versed in written law but also to promote morality in society. Magistrates such as the famed Bao Qingtian (999–1062) embodied the upright, moral judge who upheld justice and never failed to live up to his principles. Song judges specified the guilty person or party in a criminal act and meted out punishments accordingly, often in the form of caning. A guilty individual or parties brought to court for a criminal or civil offense were not viewed as wholly innocent until proven otherwise, while even accusers were viewed with a high level of suspicion by the judge. Due to costly court expenses and immediate jailing of those accused of criminal offenses, people in the Song preferred to settle disputes and quarrels privately, without the court's interference. The Song military was chiefly organized to ensure that the army could not threaten Imperial control, often at the expense of effectiveness in war. Northern Song's Military Council operated under a Chancellor, who had no control over the imperial army. The imperial army was divided among three marshals, each independently responsible to the Emperor. Since the Emperor rarely led campaigns personally, Song forces lacked unity of command. The imperial court often believed that successful generals endangered royal authority, and relieved or even executed them (notably Li Gang, Yue Fei, and Han Shizhong. Although the scholar-officials viewed military soldiers as lower members in the hierarchic social order, a person could gain status and prestige in society by becoming a high ranking military officer with a record of victorious battles. At its height, the Song military had one million soldiers divided into platoons of 50 troops, companies made of two platoons, and one battalion composed of 500 soldiers. Crossbowmen were separated from the regular infantry and placed in their own units as they were prized combatants, providing effective missile fire against cavalry charges. The government was eager to sponsor new crossbow designs that could shoot at longer ranges, while crossbowmen were also valuable when employed as long-range snipers. Song cavalry employed a slew of different weapons, including halberds, swords, bows, spears, and 'fire lances' that discharged a gunpowder blast of flame and shrapnel. Military strategy and military training were treated as science that could be studied and perfected; soldiers were tested in their skills of using weaponry and in their athletic ability. The troops were trained to follow signal standards to advance at the waving of banners and to halt at the sound of bells and drums. The Song navy was of great importance during the consolidation of the empire in the 10th century; during the war against the Southern Tang state the Song navy employed tactics such as defending large floating pontoon bridges across the Yangzi River in order to secure movements of troops and supplies. There were large naval ships in the Song that could carry 1,000 soldiers aboard their decks, while the swift-moving paddle-wheel crafts were viewed as essential fighting ships in any successful naval battle. In a battle on January 23, 971, a mass of arrow fire from Song Dynasty crossbowmen decimated the war elephant corps of the Southern Han army. This defeat not only marked the eventual submission of the Southern Han to the Song Dynasty, but also the last instance where a war elephant corps was employed as a regular division within a Chinese army. There was a total of 347 military treatises written during the Song period, as listed by the history text of the Song Shi (compiled in 1345). However, only a handful of these military treatises have survived, which includes the Wujing Zongyao written in 1044. It was the first known book to have listed formulas for gunpowder; it gave appropriate formulas for use in several different kinds of gunpowder bombs. It also provided detailed description and illustrations of double-piston pump flamethrowers, as well as instructions for the maintenance and repair of the components and equipment used in the device. In philosophy, Chinese Buddhism had waned in influence but it retained its hold on the arts and on the charities of monasteries. Buddhism had a profound influence upon the budding movement of Neo-Confucianism, led by Cheng Yi (1033–1107) and Zhu Xi (1130–1200). Mahayana Buddhism influenced Fan Zhongyan and Wang Anshi through its concept of ethical universalism, while Buddhist metaphysics had a deep impact upon the pre–Neo-Confucian doctrine of Cheng Yi. The philosophical work of Cheng Yi in turn influenced Zhu Xi. Although his writings were not accepted by his contemporary peers, Zhu's commentary and emphasis upon the Confucian classics of the Four Books as an introductory corpus to Confucian learning formed the basis of the Neo-Confucian doctrine. By the year 1241, under the sponsorship of Emperor Lizong, Zhu Xi's Four Books and his commentary on them became standard requirements of study for students attempting to pass the civil service examinations. The East Asian countries of Japan and Korea also adopted Zhu Xi's teaching, known as the Shushigaku (朱子学, School of Zhu Xi) of Japan, and in Korea the Jujahak (주자학). Buddhism's continuing influence can be seen in painted artwork such as Lin Tinggui's Luohan Laundering. However, the ideology was highly criticized and even scorned by some. The statesman and historian Ouyang Xiu (1007–1072) called the religion a "curse" that could only be remedied by uprooting it from Chinese culture and replacing it with Confucian discourse. Buddhism would not see a true revival in Chinese society until the Mongol rule of the Yuan Dynasty, with Kublai Khan's sponsorship of Tibetan Buddhism and Drogön Chögyal Phagpa as the leading lama. The Christian sect of Nestorianism—which had entered China in the Tang era—would also be revived in China under Mongol rule. The food that one consumed and the clothes that one wore in Song China were largely dictated by one's status and social class. The main food staples in the diet of the lower classes remained rice, pork, and salted fish; their clothing materials were made of hempen or cotton cloths, restricted to a color standard of black and white. Trousers were the acceptable form of attire for farming peasants, soldiers, artisans, and merchants, although wealthy merchants might choose to wear more ornate clothing and male blouses that came down below the waist. Acceptable apparel for scholar-officials was rigidly confined to a social hierarchic ranking system. However, as time went on this rule of rank-graded apparel for officials was not as strictly enforced as it was in the beginning of the dynasty. Each official was able to display his awarded status by wearing different-colored traditional silken robes that hung to the ground around his feet, specific types of headgear, and even specific styles of girdles that displayed his graded-rank of officialdom. Women in the Song period wore long dresses, blouses that came down to the knee, skirts and jackets with long or short sleeves, while women from wealthy families could wear purple scarves around their shoulders. The main difference in women's apparel from that of men was that it was fastened on the left, not on the right. There is a multitude of existing restaurant and tavern menus and listed entrées for feasts, banquets, festivals, and carnivals during the Song period, all of which reveal a very diverse and lavish diet for those of the upper class. In their meals they could choose from a wide variety of meats, including shrimp, geese, duck, mussel, shellfish, fallow deer, hare, partridge, pheasant, francolin, quail, fox, badger, clam, crab, and many others. Dairy products were absent from Chinese cuisine and culture altogether, beef was rarely consumed since the bull was a valuable draft animal, and dog meat was absent from the diet of the wealthy, although the poor could choose to eat dog meat if necessary (yet it was not part of their regular diet). People also consumed dates, raisins, jujubes, pears, plums, apricots, pear juice, lychee-fruit juice, honey and ginger drinks, pawpaw juice, spices and seasonings of Sichuan pepper, ginger, pimento, soy sauce, oil, sesame oil, salt, and vinegar. The common diet of the poor was pork, salted fish, and rice. The economy of the Song Dynasty was one of the most prosperous and advanced economies in the medieval world. Song Chinese invested their funds in joint stock companies and in multiple sailing vessels at a time when monetary gain was assured from the vigorous overseas trade and indigenous trade along the Grand Canal and Yangzi River. Prominent merchant families and private businesses were allowed to occupy industries that were not already government-operated monopolies. Both private and government-controlled industries met the needs of a growing Chinese population in the Song. Both artisans and merchants formed guilds which the state had to deal with when assessing taxes, requisitioning goods, and setting standard worker's wages and prices on goods. The iron industry was pursued by both private entrepreneurs who owned their own smelters as well as government-supervised smelting facilities. The Song economy was stable enough to produce over a hundred million kilograms (over two hundred million pounds) of iron product a year. Large scale deforestation in China would have continued if not for the 11th century innovation of the use of coal instead of charcoal in blast furnaces for smelting cast iron. Much of this iron was reserved for military use in crafting weapons and armoring troops, but some was used to fashion the many iron products needed to fill the demands of the growing indigenous market. The iron trade within China was furthered by the building of new canals which aided the flow of iron products from production centers to the large market found in the capital city. The annual output of minted copper currency in 1085 alone reached roughly six billion coins. The most notable advancement in the Song economy was the establishment of the world's first government issued paper-printed money, known as Jiaozi (see also Huizi). For the printing of paper money alone, the Song court established several government-run factories in the cities of Huizhou, Chengdu , Hangzhou , and Anqi. The size of the workforce employed in paper money factories was large; it was recorded in 1175 that the factory at Hangzhou employed more than a thousand workers a day. [Song era] investors usually divided their investment among many ships, and each ship had many investors behind it. One observer thought eagerness to invest in overseas trade was leading to an outflow of copper cash. He wrote, 'People along the coast are on intimate terms with the merchants who engage in overseas trade, either because they are fellow-countrymen or personal acquaintances…. [They give the merchants] money to take with them on their ships for purchase and return conveyance of foreign goods. They invest from ten to a hundred strings of cash, and regularly make profits of several hundred percent'. Advancements in weapons technology enhanced by Greek fire and gunpowder, including the evolution of the early flamethrower, explosive grenade, firearm, cannon, and land mine, enabled the Song Chinese to ward off their militant enemies until the Song's ultimate collapse in the late 13th century. The Wujing Zongyao manuscript of 1044 was the first book in history to provide formulas for gunpowder and their specified use in different types of bombs. While engaged in a war with the Mongols, in the year 1259 the official Li Zengbo wrote in his Kozhai Zagao, Xugaohou that the city of Qingzhou was manufacturing one to two thousand strong iron-cased bomb shells a month, dispatching to Xiangyang and Yingzhou about ten to twenty thousand such bombs at a time. In turn, the invading Mongols employed northern Chinese soldiers and used these same type of gunpowder weapons against the Song Chinese. By the 14th century the firearm and cannon could also be found in Europe, India, and the Islamic Middle East, during the early age of gunpowder warfare. As early as the Han Dynasty, when the state needed to effectively measure distances traveled throughout the empire, the Chinese relied on the mechanical odometer device. The Chinese odometer came in the form of a wheeled-carriage, its inner gears functioning off the rotated motion of the wheels, and specific units of distance—the Chinese li—marked by the mechanical striking of a drum or bell for auditory alarm. The specifications for the 11th century odometer were written by Chief Chamberlain Lu Daolong, who is quoted extensively in the historical text of the Song Shi (compiled by 1345). In the Song period, the odometer vehicle was also combined with another old complex mechanical device known as the South Pointing Chariot. This device, originally crafted by Ma Jun in the 3rd century, incorporated a differential gear that allowed a figure mounted on the vehicle to always point in the southern direction, no matter how the vehicle's wheels' turned about. The device concept of the differential gear for this navigational vehicle is now found in all modern automobiles in order to apply the equal amount of torque to wheels rotating at different speeds. Polymath figures such as the statesmen Shen Kuo and Su Song (1020–1101) embodied advancements in all fields of study, including biology, botany, zoology, geology, minerology, mechanics, horology, astronomy, pharmaceutical medicine, archeology, mathematics, cartography, optics, art criticism, and more. Su Song was best known for his horology treatise written in 1092, which described and illustrated in great detail his hydraulic-powered, tall astronomical clock tower built in Kaifeng. The clock tower featured large astronomical instruments of the armillary sphere and celestial globe, both driven by an early intermittently working escapement mechanism (roughly two centuries before the discrete verge escapement of true mechanical clocks appeared in medieval clockworks). In addition, Su Song's clock tower featured the world's first endless power-transmitting chain drive, an essential mechanical device found in many practical uses throughout the ages, such as the bicycle. Su's tower featured a rotating gear wheel with 133 clock jack manikins who were timed to rotate past shuttered windows while ringing gongs and bells, banging drums, and presenting announcement plaques. In his printed book, Su published a celestial atlas of five star charts. These star charts feature a cylindrical projection similar to Mercator projection, the latter being a cartographic innovation of Gerardus Mercator in 1569. There were many notable improvements to Chinese mathematics during the Song era. The book published in 1261 by the mathematician Yang Hui (c. 1238–1298) provided the earliest Chinese illustration of Pascal's triangle, although it was described earlier around 1100 by Jia Xian. Yang Hui also provided rules for constructing combinatorial arrangements in magic squares, provided theoretical proof for Euclid's forty-third proposition about parallelograms, and was the first to use negative coefficients of 'x' in quadratic equations. Yang's contemporary Qin Jiushao (c. 1202–1261) was the first to introduce the zero symbol into Chinese mathematics; before this blank spaces were used instead of zeros in the system of counting rods. He is also known for working with the Chinese remainder theorem, Heron's formula, and astronomical data used in determining the winter solstice. Qin's major work was the Mathematical Treatise in Nine Sections published in 1247. Geometry was essential to surveying and cartography. The earliest extant Chinese maps date to the 4th century BCE, yet it was not until the time of Pei Xiu (224–271) that topographical elevation, a formal rectangular grid system, and use of a standard graduated scale of distances was applied to terrain maps. Following a long tradition, Shen Kuo created a raised-relief map, while his other maps featured a uniform graduated scale of 1:900,000. A squared map of 1137—carved into a stone block—followed a uniform grid scale of 100 li for each gridded square, and accurately mapped the outline of the coasts and river systems of China, extending all the way to India. Furthermore, the world's oldest known terrain map in printed form comes from the edited encyclopedia of Yang Jia in 1155, which displayed western China without the formal grid system that was characteristic of more professionally-made Chinese maps. Although gazetteers had existed since 52 CE during the Han Dynasty and gazetteers accompanied by illustrative maps (Chinese: tujing) since the Sui Dynasty, the illustrated gazetteer became much more common in the Song Dynasty, when the foremost concern was for illustrative gazetteers to serve political, administrative, and military purposes. The innovation of movable type printing was made by the artisan Bi Sheng (990–1051), first described by the scientist and statesman Shen Kuo in his Dream Pool Essays of 1088. The collection of Bi Sheng's original clay-fired typeface was passed on to one of Shen Kuo's nephews, and was carefully preserved. Movable type enhanced the already widespread use of woodblock methods of printing thousands of documents and volumes of written literature, consumed eagerly by an increasingly literate public. The advancement of printing had a deep impact on education and the scholar-official class, since more books could be made faster while mass-produced, printed books were cheaper in comparison to laborious handwritten copies. The enhancement of widespread printing and print culture in the Song period was thus a direct catalyst in the rise of social mobility and expansion of the educated class of scholar elites, the latter which expanded dramatically in size from the 11th to 13th centuries. There were considerable advancements in hydraulic engineering and nautical technology during the Song Dynasty. The 10th century invention of the pound lock for canal systems allowed different water levels to be raised and lowered for separated segments of a canal, which significantly aided the safety of canal traffic and allowed for larger barges to pass through. There was the Song era innovation of watertight bulkhead compartments for ships that allowed possible damage to the hull without sinking. If ships were damaged, the Chinese of the 11th century discovered how to employ a drydock to repair boats while suspended out of water. There Song Chinese used crossbeams to brace the ribs of ships in order to strengthen them in a skeletal like structure. Stern-mounted rudders had been mounted on Chinese ships since the 1st century, as evidenced with a preserved Han tomb model of a ship. In the Song period the Chinese devised a way to mechanically raise and lower rudders in order for ships to travel in a wider range of water depths. The Song Chinese arranged the protruding teeth of anchors in a circular pattern instead of in one direction. David Graff and Robin Higham state that this arrangement "[made] them more reliable" for anchoring ships. Arguably the most important nautical innovation of the Song period was the introduction of the magnetic mariner's compass for navigation at sea. The magnetic compass was first written of by Shen Kuo in his Dream Pool Essays of 1088, as well as Zhu Yu in his Pingzhou Table Talks published in 1119. Grandiose building projects were supported by the government, including the erection of towering Buddhist Chinese pagodas and the construction of enormous bridges (wood or stone, trestle or segmental arch bridge). Many of the pagoda towers built during the Song period were erected at heights that exceeded ten stories. Some of the most famous are the Iron Pagoda built in 1049 during the Northern Song and the Liuhe Pagoda built in 1165 during the Southern Song, although there were many others. The tallest is the Liaodi Pagoda of Hebei built in the year 1055, towering in total height. Some of the bridges reached lengths of , with many being wide enough to allow two lanes of cart traffic simultaneously over a waterway or ravine. The government also oversaw construction of their own administrative offices, palace apartments, city fortifications, ancestral temples, and Buddhist temples. There were also pyramidal tomb structures in the Song era, such as the Song imperial tombs located in Gongxian, Henan province. About from Gongxian is another Song Dynasty tomb at Baisha, which features "elaborate facsimiles in brick of Chinese timber frame construction, from door lintels to pillars and pedestals to bracket sets, that adorn interior walls." The two large chambers of the Baisha tomb also feature conical-shaped roofs. Flanking the avenues leading to these tombs are lines of Song Dynasty stone statues of officials, tomb guardians, animals, and mythological creatures. In addition to the Song gentry's antiquarian pursuits of art collecting, scholar-officials during the Song became highly interested in retrieving ancient relics from archaeological sites, in order to revive the use of ancient vessels in ceremonies of state ritual. Scholar-officials of the Song period claimed to have discovered ancient bronze vessels that were created as far back as the Shang Dynasty (1600–1046 BCE) which bore the writing characters of the Shang era. Some attempted to recreate these bronze vessels by using imagination alone, not by observing tangible evidence of relics; this practice was criticized by Shen Kuo in his work of 1088. Yet Shen Kuo had much more to criticize than this practice alone. Shen objected to the idea of his peers that ancient relics were products created by famous "sages" in lore or the ancient aristocratic class; Shen rightfully attributed the discovered handicrafts and vessels from ancient times as the work of artisans and commoners from previous eras. He also disapproved of his peers' pursuit of archaeology simply to enhance state ritual, since Shen not only took an interdisciplinary approach with the study of archaeology, but he also emphasized the study of functionality and investigating what was the ancient relics' original processes of manufacture. Shen used ancient texts and existing models of armillary spheres to create one based on ancient standards; Shen described ancient weaponry such as the use of a scaled sighting device on crossbows; while experimenting with ancient musical measures, Shen suggested hanging an ancient bell by using a hollow handle. Despite the gentry's overriding interest in archaeology simply for reviving ancient state rituals, some of Shen's peers took a similar approach to the study of archaeology. His contemporary Ouyang Xiu (1007–1072) compiled an analytical catalogue of ancient rubbings on stone and bronze which pioneered ideas in early epigraphy and archeology. During the 11th century, Song scholars discovered the ancient shrine of Wu Liang (78–151 AD), a scholar of the Han Dynasty (202 BC – 220 AD); they produced rubbings of the carvings and bas-reliefs decorating the walls of his tomb so that they could be analyzed elsewhere. On the unreliability of historical works written after the fact, scholar-official Zhao Mingcheng (1081–1129) stated "…the inscriptions on stone and bronze are made at the time the events took place and can be trusted without reservation, and thus discrepancies may be discovered." Historian R.C. Rudolph states that Zhao's emphasis on consulting contemporary sources for accurate dating is parallel with the concern of the German historian Leopold von Ranke (1795–1886), and was in fact emphasized by many Song scholars. The Song scholar Hong Mai (1123–1202) heavily criticized what he called the court's "ridiculous" archaeological catalogue Bogutu compiled during the Huizong reign periods of Zheng He and Xuan He (1111–1125). Hong Mai obtained old vessels from the Han Dynasty and compared them with the descriptions offered in the catalogue, which he found so inaccurate he stated he had to "hold my sides with laughter." 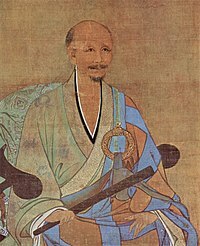 Hong Mai pointed out that the erroneous material was the fault of Chancellor Cai Jing (1047–1126), who prohibited scholars from reading and consulting the written histories.